Each morning I take the tool trailer (and my crew) up to the worksite, meet with the owner to review yesterday's work, talk about new projects and areas and then start my crew on their jobs for the day. Then I head back home to work with the crew in the shop on our onging projects. It's a busy time for me (and the crew) and the days go by in a flash. The good news is that the project is shaping up quickly. Tomorrow I'll do a report on the building as the carpenters are making rapid progress and the structure is shaping up very fast. It is unlike anything the carpenters have ever built previously and they are enjoying the unusual and challenging project. In the shop we applied the fiberglass reinforced concrete to the bottom half of the hot air balloon and it looks fabulous. Working upside down with concrete is never easy and Hailey, Sarah and Jenessa did a fabulous job. Tomorrow they should be able to finish the top half without any problem. The balloon basket is also nearing completion and looking pretty cool as well. The balloon will be bolted to the top of the pole above the basket. This thing is going to be HIGH! 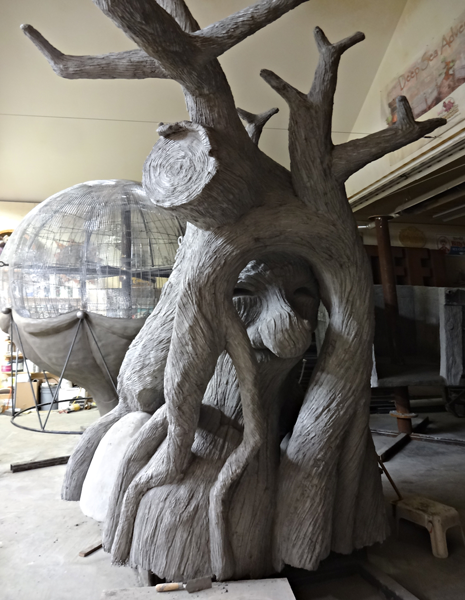 The tree is now cured sufficiently to allow us to begin the painting process tomorrow. I can hardly wait to see color!